So MacMost has compiled a list of our top “power user” keyboard shortcuts for macOS 10.12 (Sierra). 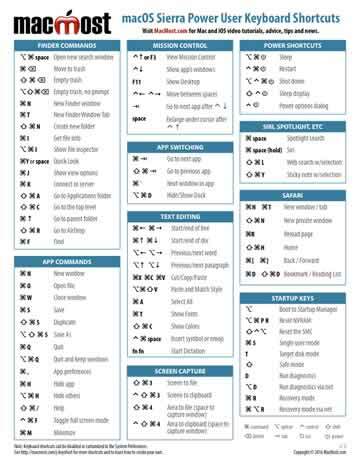 Here they all are on a single PDF page, downloadable and printable: The MacMost Sierra Power User Keyboard Shortcuts. Download it and pass it along! This is a great list Gary! Thanks for compiling and sharing! Shirley: I usually go with the same order they are shown when you see them in the menu. Don’t know if I am perfect on that, but it is my intention to show them the same way macOS does. Thanks for the Shortcuts Page Gary. I couldn’t manage without your continued help & support. Thanks Gary. We all really appreciate that you do this. It’s always good to have this on hand.